To fulfill my vocation to leave the world and devote myself entirely to the service of souls to lead them to God, and save myself. One of the recurring problems in Christian history has been that imperial incursions have led to hostility to foreigners, thereby making life and work more perilous for missionaries. Another reason for this has been that many missionaries have, unfortunately, been more agents of their empire than of Christ. That reality has made matters worse for the missionaries who have not been imperial agents. The British invasion of Lhasa, Tibet, in 1904 led to anti-Christian sentiment and violence in Tibet. Buddhist monks attacked missionaries. Blessed Maurice Tornay had to contend with such hostility. Tornay, born in Rosière, Valais, Switzerland, on August 31, 1910, was devout from an early age. The seventh child (of eight) of Jean-Joseph Tornay and Faustina Dossier grew up in a pious family. He was also a fine student, especially of French literature, as well as the writings of St. Francis de Sales and St. Therésè of Lisieux. Tornay joined the Canons Regular of Saint Augustine, Hospitallers of Saint Nicholas and Grand-St-Bernard of Mont Joux. He, a novice from August 25, 1931, made his first vows on September 8, 1932, and his final vows in 1935. Surgery for a stomach ulcer, followed by recuperation, interrupted preparation for missionary work in 1934, but he, healed, headed for the borderlands of Tibet and China in 1936. At Weixi, Yunnan, China, Tornay continued preparation. He learned the local language, studied dentistry, medicine, and theology, and prepared for the priesthood. Our saint, ordained in Hanoi on April 24, 1938, founded and led the Houa-Lo-Pa seminary. The Japanese invasion of 1939 forced him to resort to begging to acquire food for his students. In 1945 Tornay became the pastor of the Yerkalo mission in Tibet. The Thirteenth Dalai Lama had died in 1933. The Fourteenth Dalai Lama, born in 1935, although enthroned in 1940, did not begin to rule until 1950. Anti-Christian persecution forced Tornay to leave Tibet and seek diplomatic pressure to intervene with the Tibetan government. All diplomatic intervention failed. On August 11, 1949, our saint was en route to Lhasa, to seek a meeting with the Tibetan government, when guards ambushed and shot him at To-Thong, Tibet. He was 37 years old. Pope John Paul II declared Tornay a Venerable in 1992 then a Blessed the following year. When Mozart was my age, he was dead. When Blessed Maurice Tornay was my age, he was dead. And what he had done for the glory of God puts me to shame. whom you called to preach the Gospel to the people of China and Tibet. 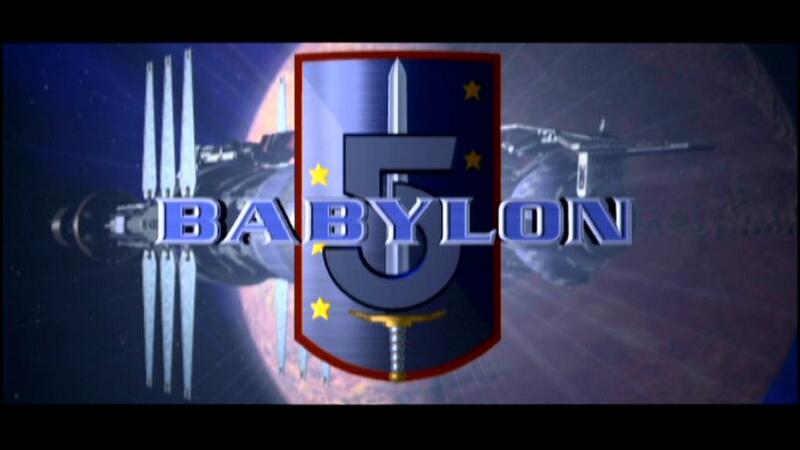 Voices in Dark was supposed to be the first of a series of direct-to-DVD releases called Babylon 5–The Lost Tales. It was the only release, and this fact is unfortunate. Voices in the Dark is not without flaws, but it is vastly superior to much of what people commit to DVDs. 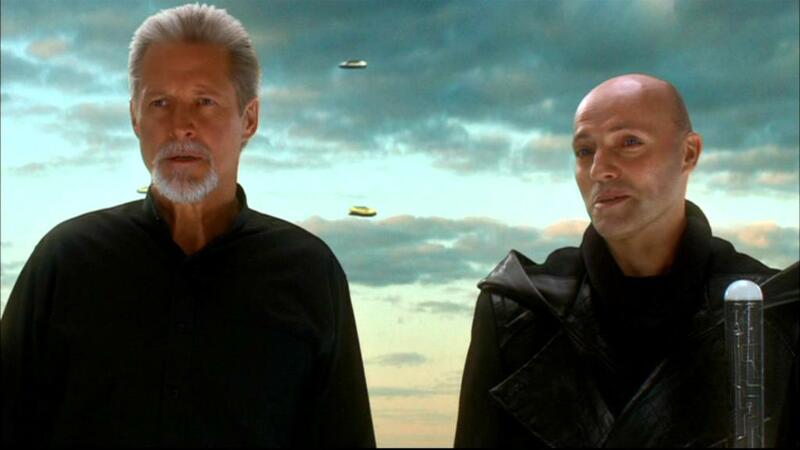 Warner Brothers provided an inadequate budget for special effects, so let us not be too harsh toward J. Michael Straczynski (JMS) for the green screen problems. Blame the suits. Besides, the two connected stories are the real reasons to watch this DVD production. These tales (Over Here and Over There) are set in 2271, on the tenth anniversary of the founding of the Interstellar Alliance. I have learned from Voices in the Dark and A Call to Arms (not to mention Sleeping in Light) that Interstellar Alliance anniversaries divisible by five are not quiet times. I wonder what hell broke loose or threatened to do so on the fifteenth anniversary. Now there is an untold story. 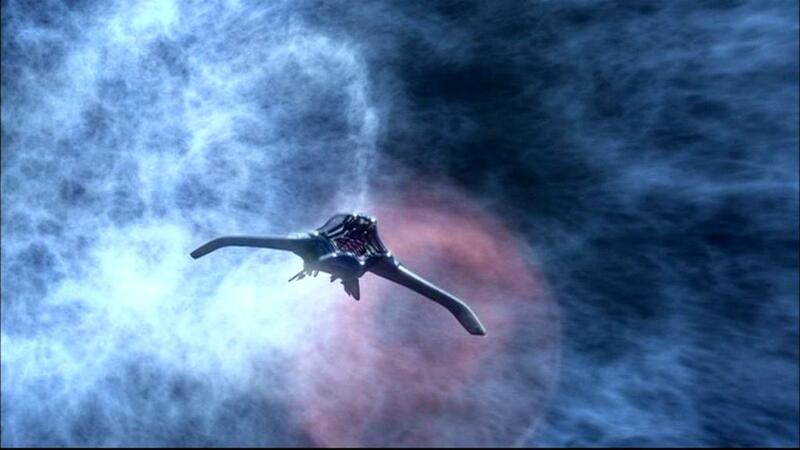 Anyhow, literal Hell does break loose on Babylon 5 in the first half, Over There. The B5 programs have never shied away from religion, and Over There is overtly religious. JMS, raised Roman Catholic, has been an Atheist (albeit not a militant one) for some time, and he, the author of Voices in the Dark, is comfortable with addressing religious topics. Post-apocalyptic religion is integral to another JMS series, Jeremiah, which aired on Showtime from 2002 to 2004, for example. In this case, the topic du film is demonic possession. 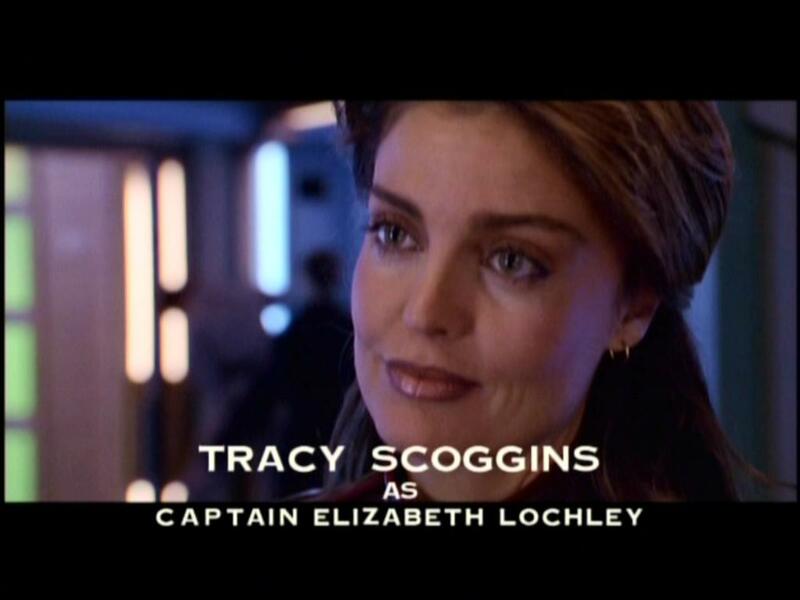 Elizabeth Lochley is still in command of Babylon 5; she is entering her tenth year in that position. She thinks of the space station as her home now. And she has received a promotion; Lochley has progressed from captain to colonel. Her home is not quiet, though. Simon Burke is a station maintenance worker who has just returned from a visit to his family on Earth. (The Drakh plague has been over for a few years, thanks to the efforts of the gallant crew of the Excalibur.) Simon is not himself, however. He hears another voice inside his head, and the cause of that voice takes him over. Security personnel detain Simon, and the vicinity of his cell is considerably colder than any other place in the area. 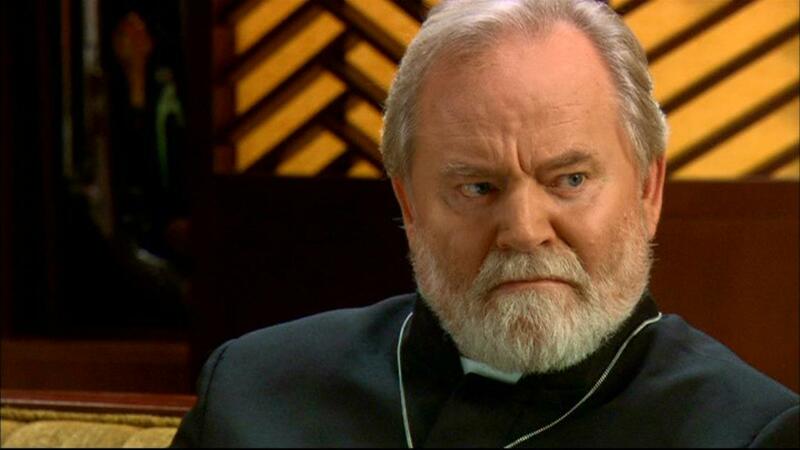 Lochley sends for a Roman Catholic priest, and Father Cassidy arrives. She explains the situation to Cassidy, who asks her about her spiritual state. Lochley admits that she attends services from time to time, but that she feels guilty because of her spotty attendance. Cassidy concludes non-judgmentally that she is like many people. Lochley is still religious, though, and laments the fact that religious practice among humans is in decline. Cassidy is not worried, however, for, as he says, the Church still has few tricks up its sleeve. Lochley and Cassidy visit Simon Burke’s cell, where the demon inside Simon speaks to Cassidy. The demon says that God has salted the heavens with demons as part of a plan to draw people toward religious practice. 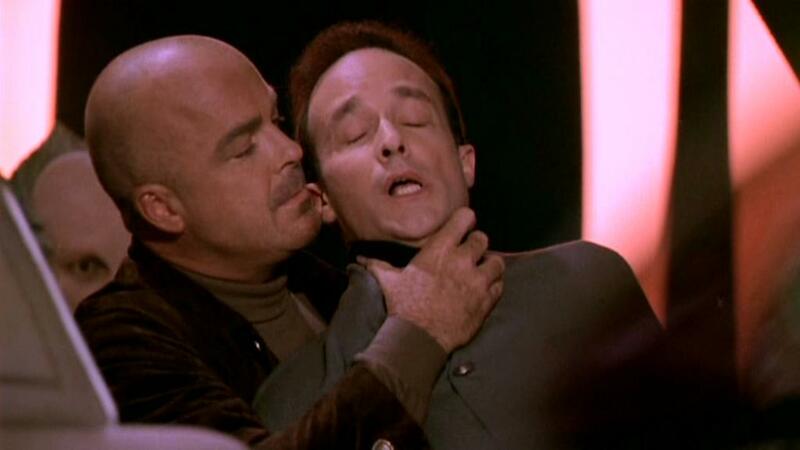 The demon asks to be exorcised on Babylon 5. Yet Lochley is skeptical of the demon’s claim, and she investigates until she finds the log of the captain of the transport ship that carried Simon back from Earth. The captain noticed cold spots and other demonic manifestations. Lochley realizes that the demon possessed Simon on Earth, and that this constituted a jailbreak; God had cast the demons from the heavens to Earth, to remain for the remainder of the life of the planet. The exorcism will occur on Earth. Father Cassidy will return to Earth, too, and brief the Pope, whom he has wanted to meet for some time. 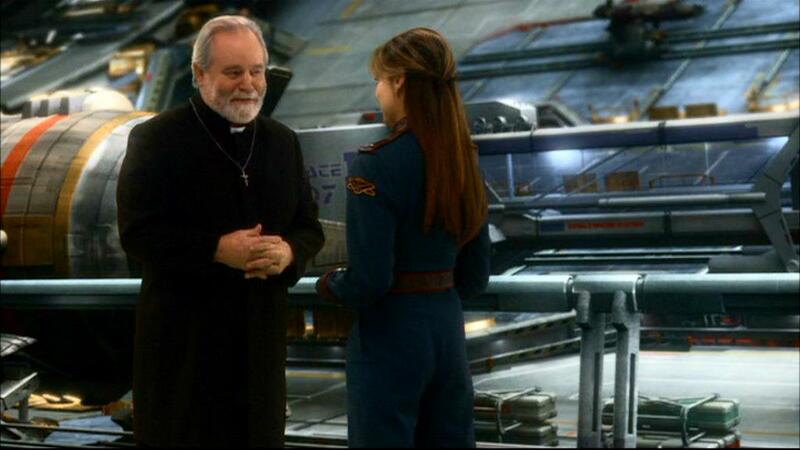 Pope Bernadette II (in office during the Babylon 5 and Crusade series) is apparently dead, and her successor is male, for Cassidy refers to the “Holy Father.” Before he departs, the priest tells Lochley that she should pursue Holy Orders if she changes careers. “Do you think I’m religious enough?” the Colonel asks. “You’ll do!” Cassidy replies enthusiastically. President John Sheridan is traveling to Babylon 5 through Quantum Space (which is twice as fast as traveling through hyperspace). Before he arrives at the space station, however, he is scheduled to rendezvous with a Centauri vessel and pick up Prince Dius Vintari, son of the late Emperor Cartagia and third in line to the throne. Cartagia made many enemies, whom Vintari has inherited. The prince has grown up in a dog-eat-dog environment, and he has revenge on his mind. He can do nothing about his circumstances now, but plans a “reckoning” when he ascends to the throne, after both Emperor Mollari II (in office) and (Vir) Cotto (in line after Mollari) die. Vintari has not known affection, just manipulation and distrust. Galen tells Sheridan that there is a way to prevent this devastation. It is all very simple; kill Vintari. Who will miss him enough to protest the prince’s death? Sheridan is reluctant to do this. 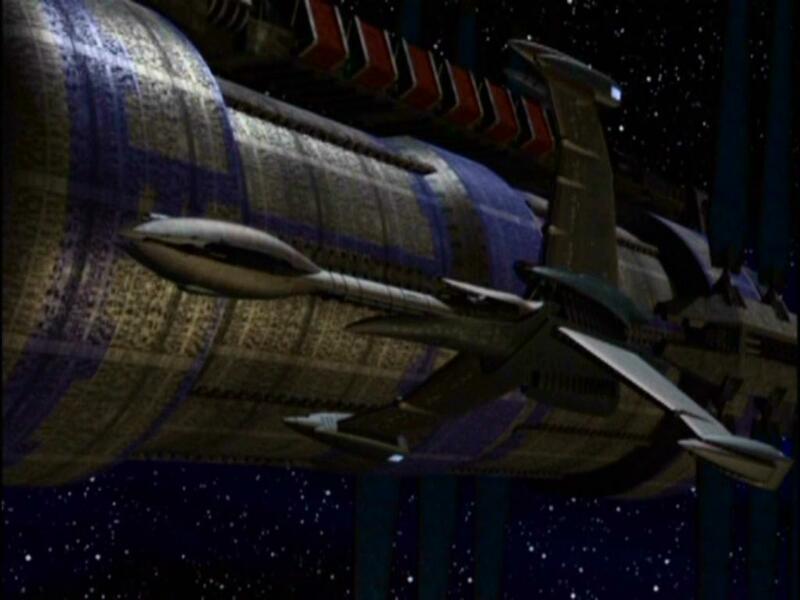 It seems that Vintari is fascinated with Starfury fighter crafts, and that, as part of the tenth anniversary events, Sheridan will travel from his Valen-Class ship via Starfury, not a shuttle craft. Sheridan asks if Vintari would like to fly a Starfury, too. The President knows that Galen has arranged for the weapons systems on his Starfury to “malfunction” and target Vintari’s ship. Sheridan ponders doing nothing, thereby allowing the prince to die. But the President turns off his Starfury’s weapons in time. With Delenn’s approval, Sheridan asks Vintari to come to live in his household on Minbar, where the prince can experience kindness. Vintari has had some dreams recently. In them, he is flying a Starfury, and “something wonderful happens.” The prince has told Sheridan this. Sheridan recounts this when an angered Galen confronts him. Did Galen send this dream to Vintari? “I get around,” the techno-mage admits. It seems that Galen has been manipulating Sheridan and Vintari, and is really not disappointed in the President’s decision. Sheridan tells Galen that he will try to dissuade Vintari from vengeful ways, but has not ruled out killing him, if that is required to save Earth. So Vintari goes to live on Minbar for a while. 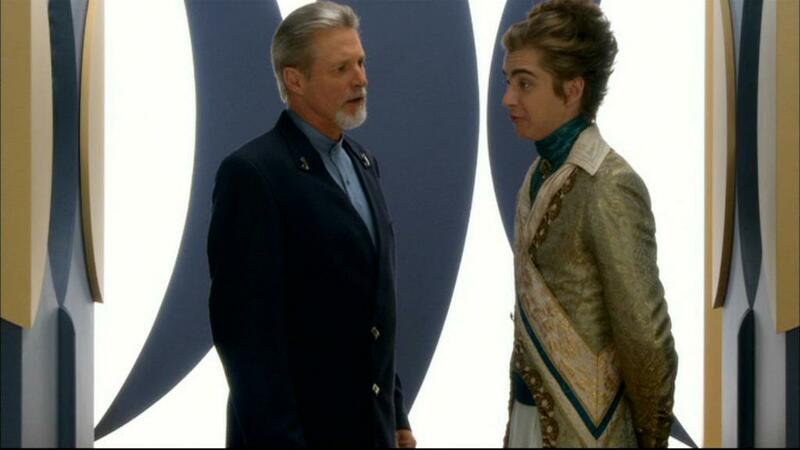 Do Sheridan and Delenn succeed in changing him? I do not know; that is an untold tale. I notice something about the characters in Over There. Vintari, the villain, is somewhat sympathetic, or at least understandable. Sheridan, our main hero, is willing to commit murder. 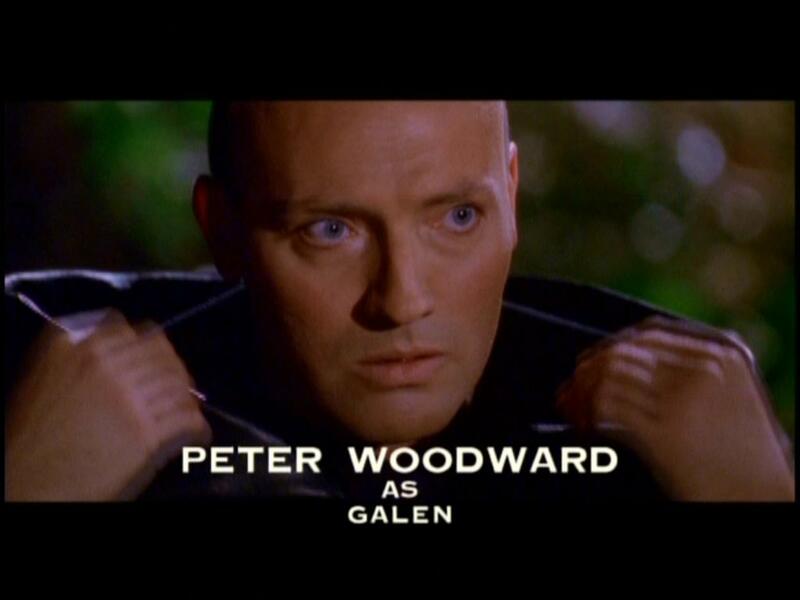 And how heroic is Galen, really? The characters exist in shades of gray. 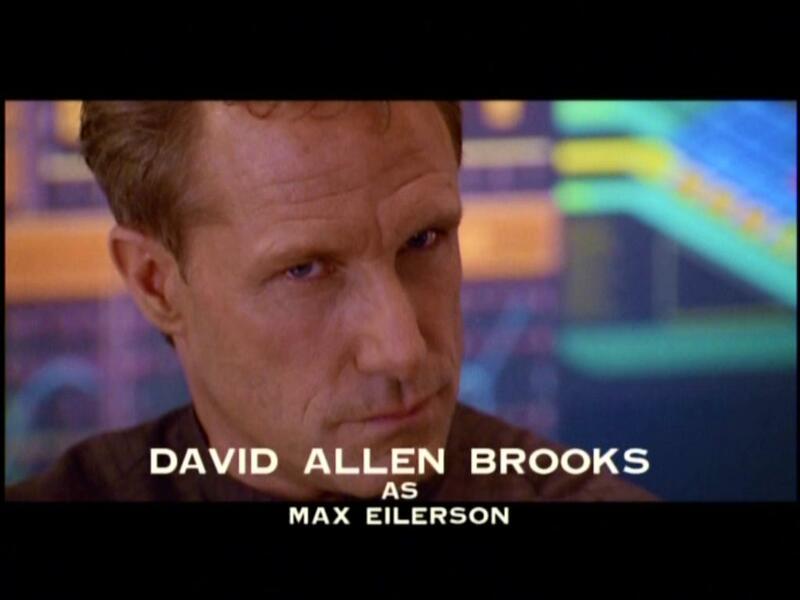 This is consistent with other characters in the Babylon 5 universe, too. 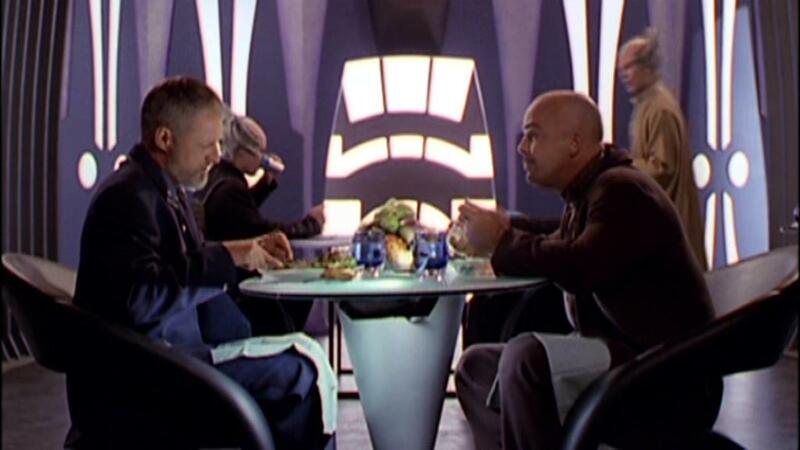 Voices in the Dark is the last of the filmed Babylon 5 productions, although some previously filmed episodes and a TNT movie (In the Beginning) contain scenes set after this chronologically. My journey through this universe is nearing its end, with two more summary-review posts left. This has been a spectacular walk through these works of JMS, and I regret that I am nearly out of this material. I plan to take a break from regular B5 viewing for a while after post #92, but to return after I have permitted enough fallow time. My interests come in seasons, and constant saturation in any project holds no appeal for me. and writing new reviews at SUNDRY THOUGHTS. There are many possible titles left to cover. Turner Network Television (TNT) canceled this series before it aired the first episode. So Crusade never had a chance to develop into what would have been its full glory. Nevertheless, the thirteen episodes produced and aired (and now available on discs) are worth watching, for they contain excellent writing and character development. The year is 2267. A Drakh plague promises to kill all life on Earth within five years unless someone can find a cure. So the Interstellar Alliance is on the job, assigning Rangers to look and listen for leads, which they pass along to the crew of Excalibur, the ship from A Call to Arms. Meanwhile, Earth’s economy, dependent on interstellar commerce, has collapsed, civil unrest is widespread, people have already begun to die, and doomsday cults are sprouting up. Captain Gideon is an edgy character, the kind of man who likes to gamble, play poker with an apologetic thief, and who never refuses to answer a distress call. Gideon bears the burden of leading the expedition to find a cure for a plague that can kill 10 billion people, so he is willing to break any law and take any risk necessary to complete his objective. Under these circumstances, he distinguishes between what is moral and what is right. Gideon has an unusual possession, an Apocalypse Box. It speaks to him, providing hints about where to go next in search of a cure for the Drakh plague. Sometimes the box lies to Gideon, and tells him not to trust it. 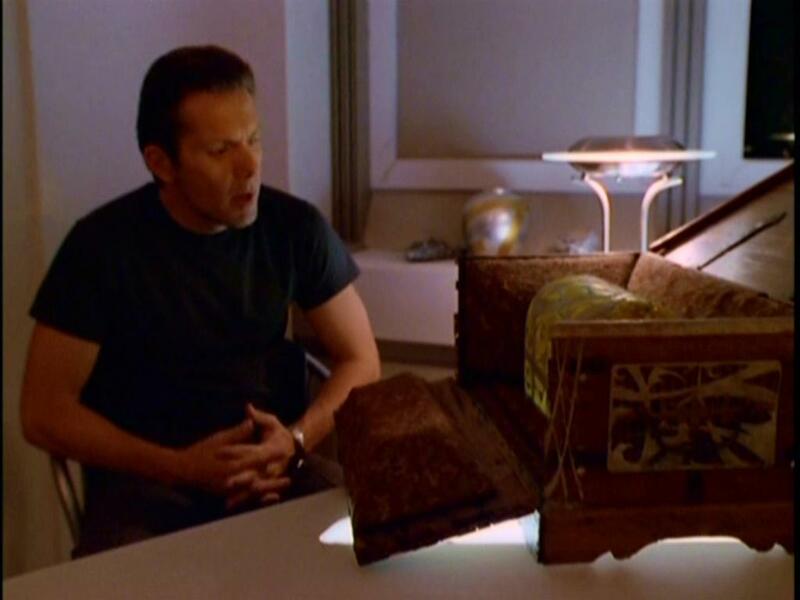 The nature and origin of the Apocalypse Box remains mysterious, given the short run of the series. 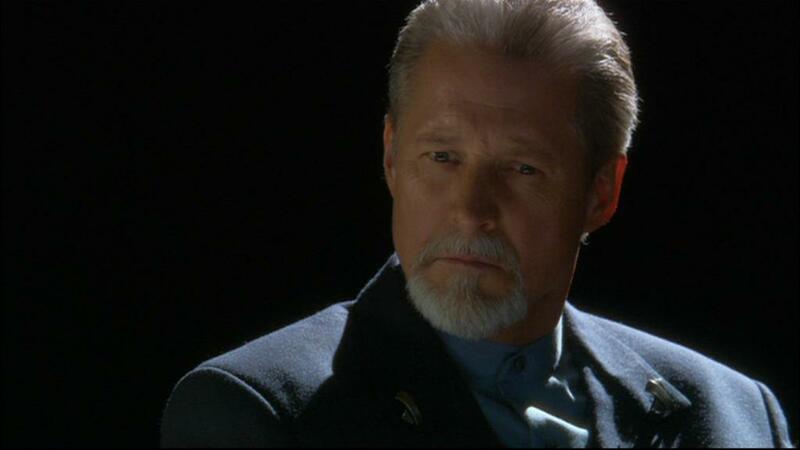 Captain Lochley is still in command at Babylon 5 in 2267. 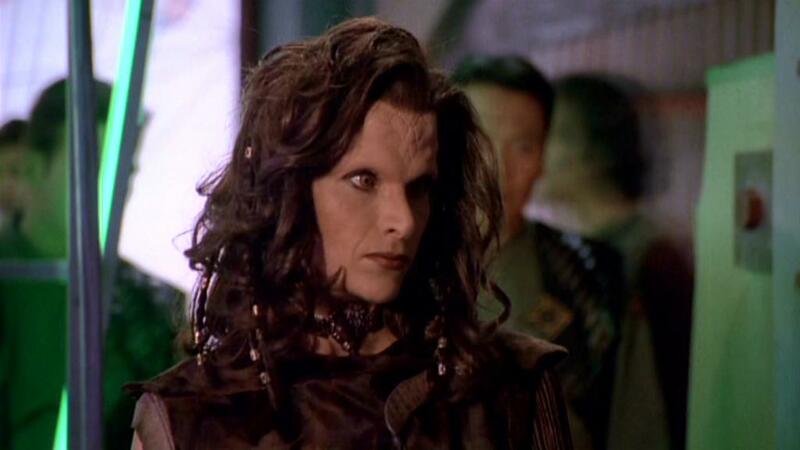 Her path crosses that of Captain Gideon in three of the thirteen episodes: once on Babylon 5, once on Mars, and again in outer space, when he rescues her. Lochley and Gideon would make a good couple, if the demands of their careers did not keep them apart. 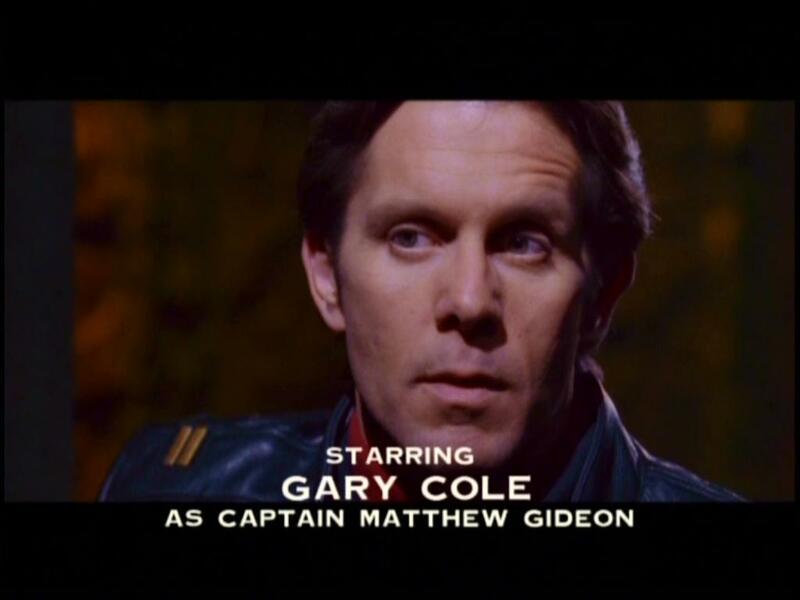 John Matheson, the First Officer, is Gideon’s friend. 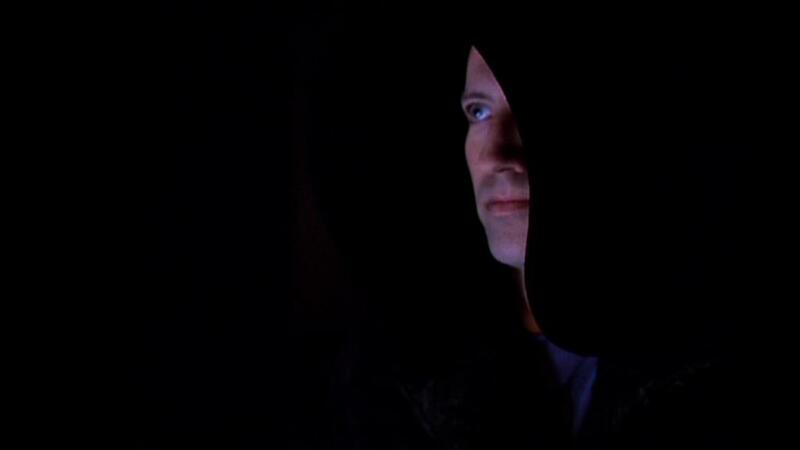 Matheson is a telepath, and can belong to Earth Force because Psi-Corps no longer exists. Yet Matheson is subject to periodic telepathic auditing by the Bureau of Telepath Integration. The XO grew up Roman Catholic, and might still belong to that denomination. And he is conscientious and quite protective of the crew and the mission. Max Eilerson is an archaeologist working for Interplanetary Expeditions (IPX), which seeks old alien technology more advanced than anything known to humans. (IPX has connections to Earth Force.) Eilerson is also a language expert, a genius and child prodigy, and an obnoxious person. He thinks often about his corporate bonuses, although profit alone does not motivate him; he has a conscience, too. And he is a very good dancer. Galen, a recently exiled techno-mage, rescued Matthew Gideon in 2258 (during the techno-mage exodus), when a hybrid Earth-Shadow vessel destroyed the E.A.S. 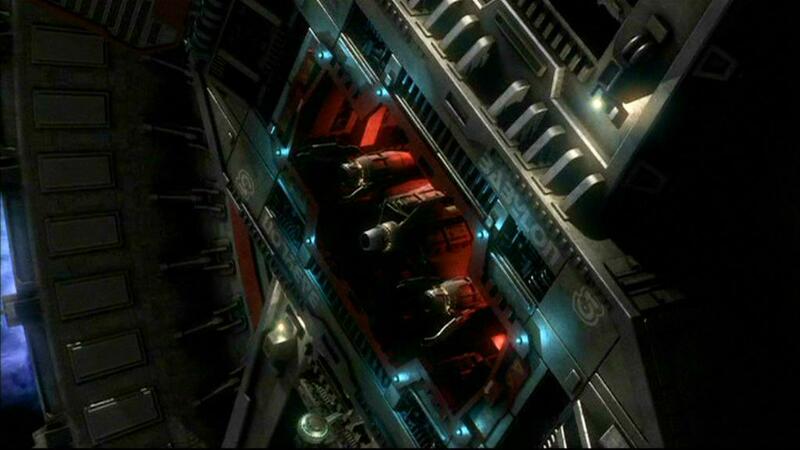 Cerberus, of which Gideon was a crew member and the sole survivor. He protects Captain Gideon, whom he does not always obey. Galen is a man who keeps secrets, such as the origin of the technology he and his fellow techno-mages use to simulate magic. It is Shadow technology. And Galen harbors deep and abiding anger, which he directs at God or the universe. 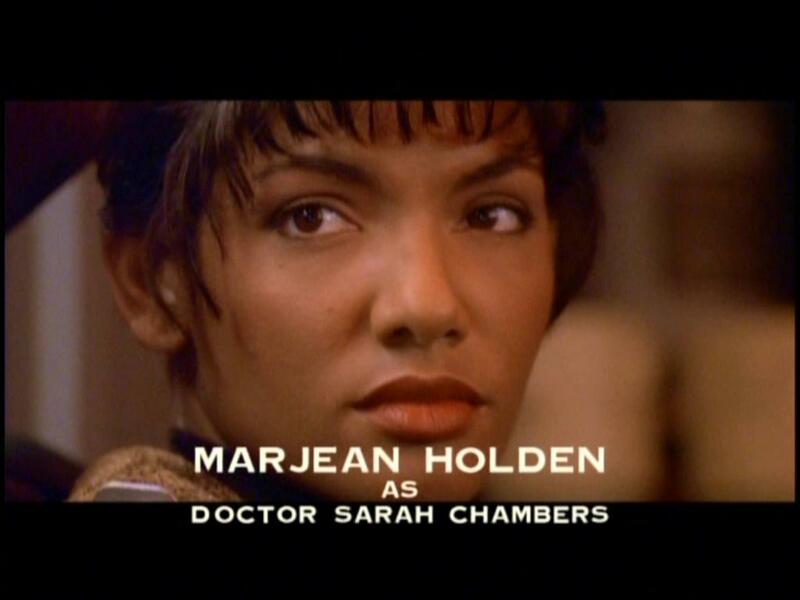 Dr. Sarah Chambers is the Chief Medical Officer of the Excalibur. She has the most personal stake in finding a cure for the Drakh plague, for her sister is on Earth. An expert in viruses, Dr. Chambers is qualified for her post. Dureena Nafeel is a thief, and, as she puts it, “a damn good one.” Her skills in breaking and entering prove invaluable many times. The Shadows destroyed her home planet, Zander Prime, during the last days of the Shadow War, in 2261. She is not the last member of her species, but she will be soon; the remaining survivors are dying of the Drakh plague. Dureena is a real spitfire; to call her assertive is to understate reality. A former slave, she has had a difficult life, and has learned how to survive. 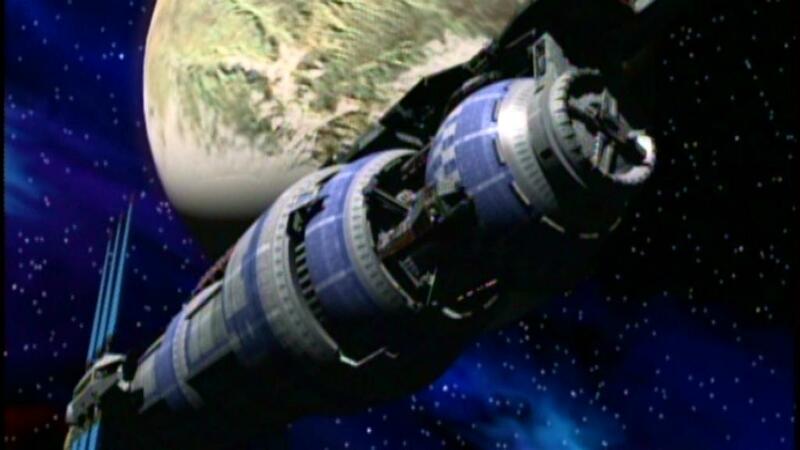 I do not know how to review the Crusade episodes in the same way as Babylon 5 episodes, for Crusade never had a chance to begin or develop any story arcs. I can watch an early Season 1 B5 episode and identify what flows from it, but this is not an option with Crusade. I would write that the series ended because of creative differences between TNT executives and series creator J. Michael Straczynski (JMS), but that explanation would imply that the TNT executives had any creativity within them. Anyhow, the suits at TNT wanted JMS to make a show that would appeal to wrestling fans, and JMS refused. Instead, JMS wanted to make a show with action in it yet a great deal of philosophy. In my favorite episode, The Needs of Earth, an alien is on the run from his government. He has in his care files going back hundreds of years, and the government wants all of the back. These files contain art and music, what the alien consider the most important knowledge in a society that has turned its back on those aspects of culture. Dr. Chambers recognizes that Earth needs a cure for the Drakh plague, but that not that alone; people need hope, art, and beauty, too. There is an explanation for this. TNT instigated a redesign of the uniforms, for the better. This change caused the need to change the order of episode broadcast. Racing the Night (with gray uniforms) was supposed to be the first episode aired. But TNT insisted that JMS write a new first episode, the clunky War Zone (with black uniforms). The rearrangement of episodes does lead to some interesting experiences, such as Lochley and Gideon meeting for the first time twice, characters in Racing the Night explaining parts of their backgrounds when black uniform episodes have revealed those facts already, et cetera. The crew of the Excalibur would have found a cure for the Drakh plague by the middle of the second season, had there been one. By this time, Gideon and crew would have discovered Earth Force black ops involving Shadow technology forbidden by the Interstellar Alliance, and the series would have taken on a very different complexion for the remainder of its five-year run. But, thanks to TNT, nobody will have the pleasure of seeing that play out. So I savor what little the suits have allowed me. 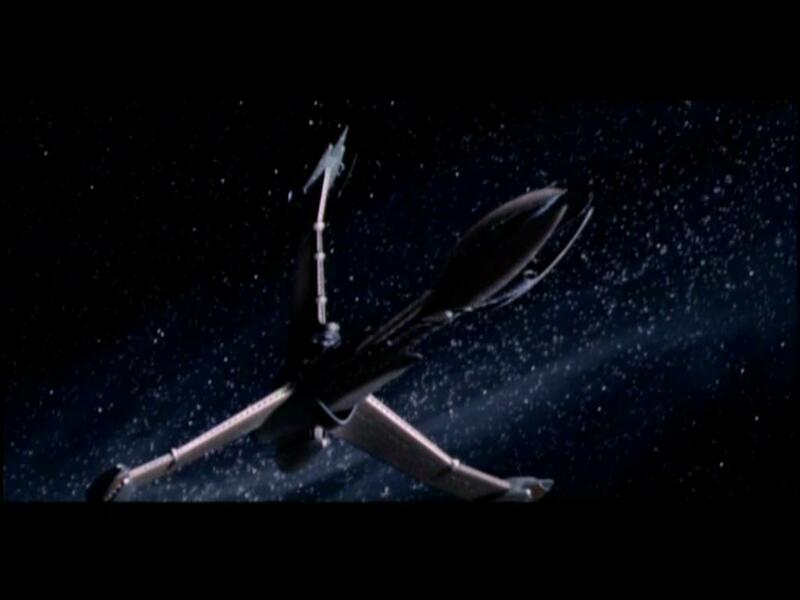 A Call to Arms is the darkest in tone of all the Babylon 5 movies. And, if it is not the best of them, it is the second best. The stakes are high, for they are nothing less than the fate of all life on Earth. It is November 2266, in the days approaching the fifth anniversary of the founding of the Interstellar Alliance. Despite the Alliance’s difficult first year, Sheridan has succeeded in establishing peace among the member governments. He has moved past his rookie mistakes and grown into his office, but his days of adventure are not over. Also, the Telepath War is a recent memory, with a memorial to those who died in that conflict planned for the near future. 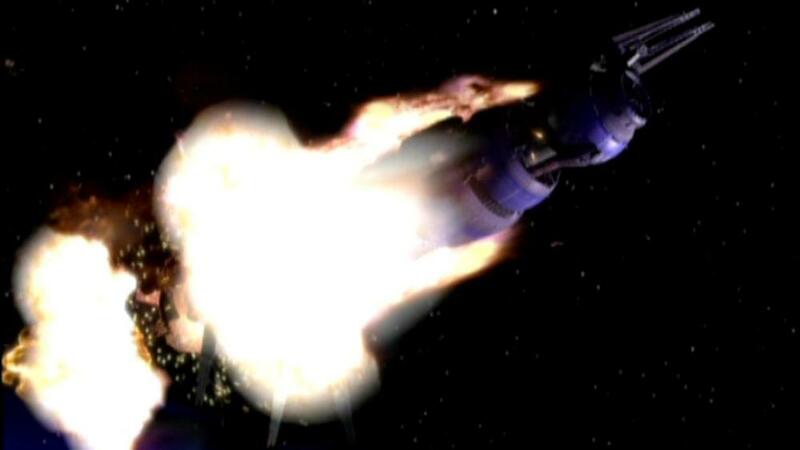 Psi-Corps is no more, and Lyta Alexander and Lennier are both dead. Much has changed since Sheridan and Delenn relocated Interstellar Alliance headquarters to Minbar, but one legacy of the Shadow War is about to endanger Earth. Sheridan and Garibaldi rendezvous in outer space. This is a top-secret operation, for they are meeting to discuss the new Victory Class vessels, of which few people know anything. 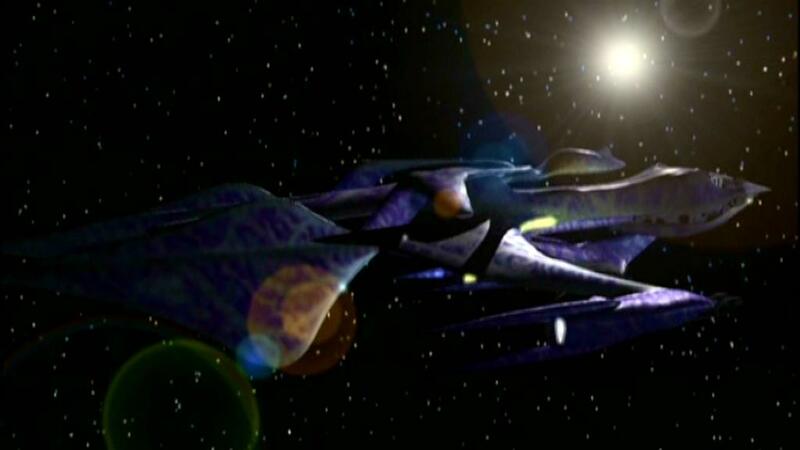 The Victory Class is the product of reverse engineering Minbari and Vorlon technology; these ships are advanced and untested. Sheridan and Garibaldi think that nobody can follow them, but they do not know that Galen, a techno-mage is observing them from afar. Techno-mages, who use technology to simulate magic, appeared first in the second season (set in 2258), when they were traveling to parts of space unknown in advance of what turned out to be the Shadow War. They are still hiding out in 2266, and Galen considers this a mistake. The other techno-mages call him to account for making contact with the outside. Yet Galen persists. Through technology he warns Sheridan about an impending threat. The first such contact occurs as Sheridan and Garibaldi inspect the two Victory class prototypes, the Excalibur and the Victory. Mr. Drake, who is in charge of overseeing the final stages of construction and testing, is a perfectionist who takes his job very slowly. Yet Garibaldi, to whom Drake answers, forces him to speed up the process. The ships must be ready soon. The Victory Class design includes a really big and powerful gun, but with a caveat: it uses so much power that the ship is essentially a sitting duck for one minute after firing it. Galen continues to contact Sheridan, as well as to warn others. Among these is Dureena Nafeel, who is, to the best of her knowledge, the last of her species. The Shadows destroyed her homeworld, Zander Prime, during the final days of the Shadow War. She has had a hard life, and is a spitfire. 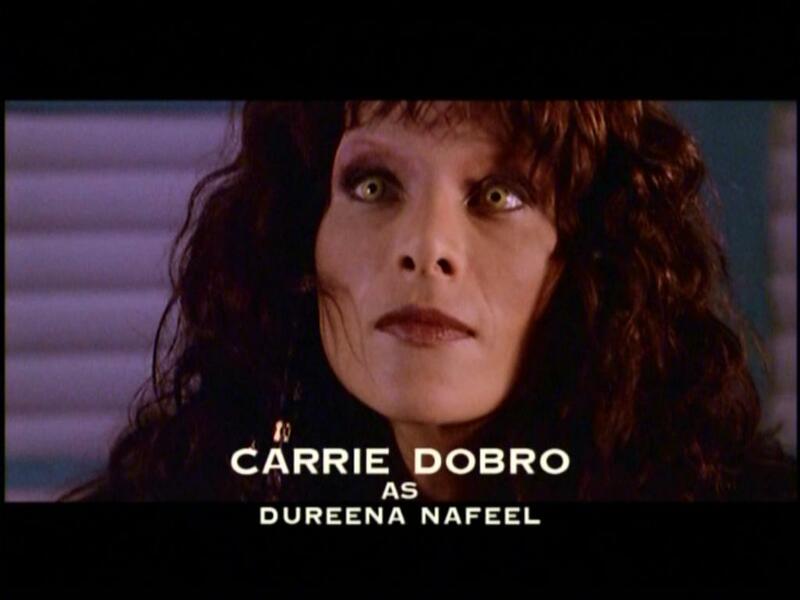 Dureena is also a member of the Thieving Guild, and she makes contact with the local on Babylon 5 after arriving at the station. First, however, she must check in with Security Chief Zack Allan, who tells her to surrender all weapons. She has many weapons, hence Zack’s facial expression. 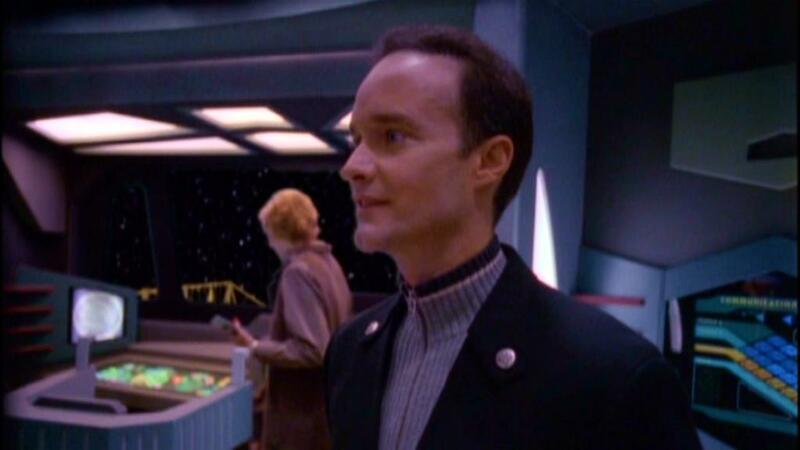 Galen has also made contact with Earth Force captain Leonard Anderson, who goes AWOL to travel to Babylon 5, to rendezvous with Dureena and Sheridan. Galen has shown each of these three individuals the faces of the others, as well as that of a Drazi. Both Garibaldi and Lochley think that Sheridan might not be firing on all thrusters, but the coincidences confirm everything he has said. These three people who have never met each other recognize each other, and they know many of the same facts, courtesy of Galen. The name Daltron VII comes up; Galen said that Earth might suffer the same fate as Daltron VII. Anderson is a heroic figure. He did not go AWOL lightly. He is married with a young daughter, whom he has promised to protect from monsters. The monsters are quite real, and they have something to do with Daltron VII. And he regrets not having sided with Sheridan during the Earth Civil War; this is his chance to do the right thing. 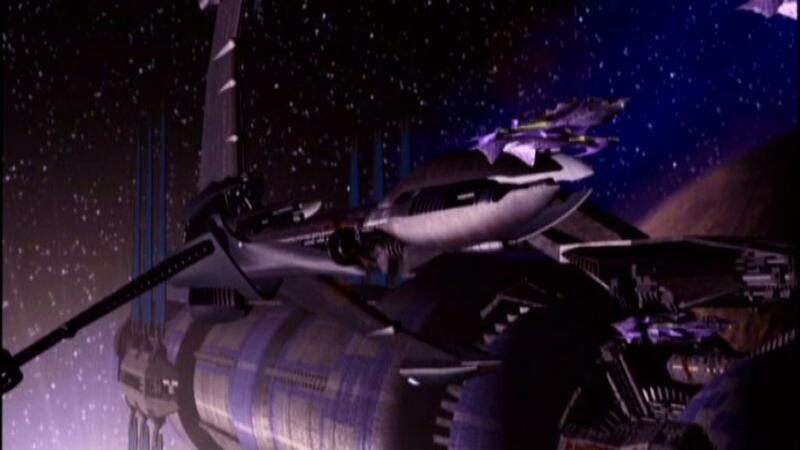 Sheridan and Delenn depart Babylon 5 on board the Charon, whose crew staffs the Victory and the Excalibur. 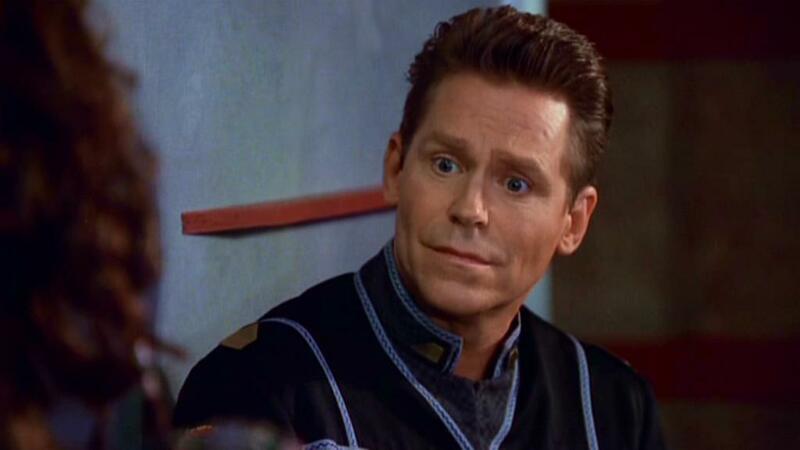 (If you are the President of the Interstellar Alliance, is it stealing if you take ships you technically own?) Sheridan commands the Excalibur, and Anderson is in charge on the Victory. The Excalibur and the Victory arrive at Daltron VII, now a dead world. It has only been a dead world for a week, though. And Shadow technology caused this. The Shadows left the galaxy six years ago, so another species has their technology. Meanwhile, Garibaldi (in the company of Drake) pursues Sheridan to Daltron VII on a White Star. A Drakh (yes, those aliens who took over Centauri Prime) fleet approaches the Victory and the Excalibur at Daltron VII. The Drakh ships receive a transmission then attack the two ships. Our heroes defeat the Drakh fleet yet detect a death cloud, at the heart of which is the last Shadow planet killer; it is headed for Earth. Sheridan, Anderson, and their crews enter hyperspace and head for Earth. There is no time to lose. 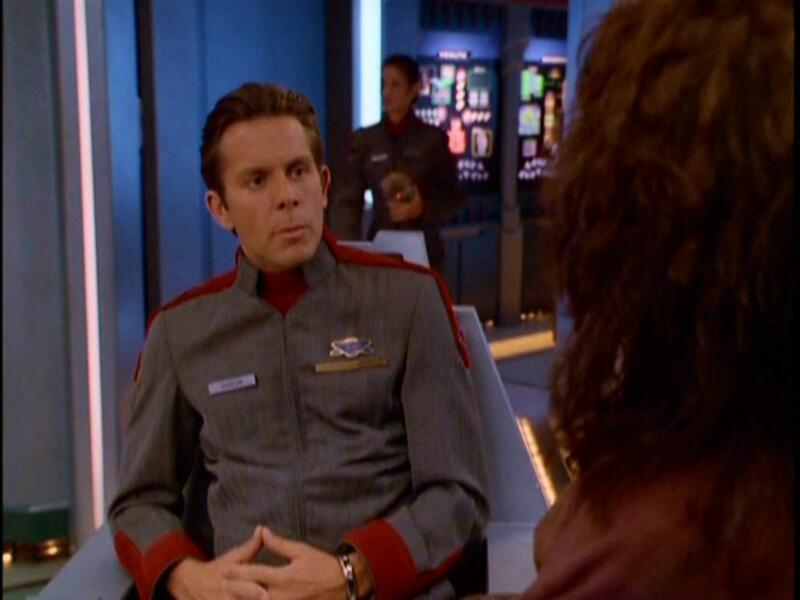 Sheridan notifies Delenn, who is summoning Alliance ships as quickly as possible, but they will probably not arrive in time. 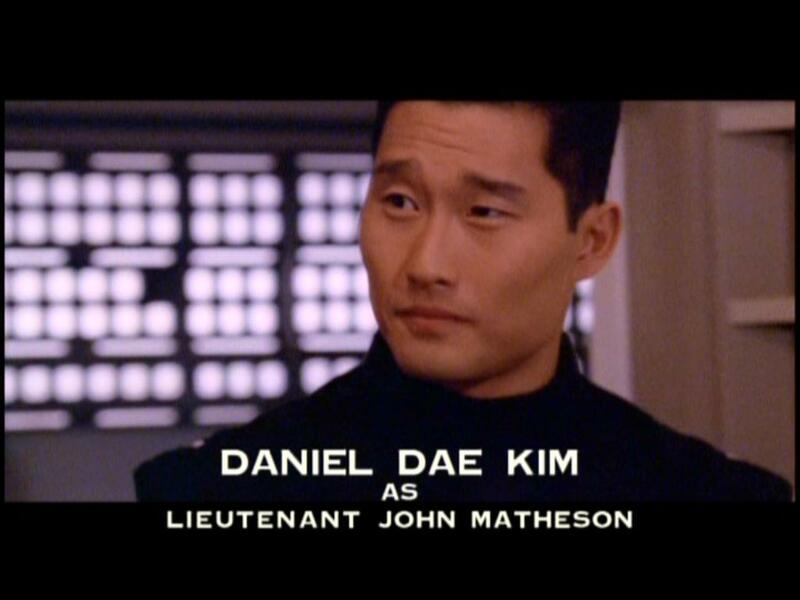 Then he calls Lochley at Babylon 5. She is skeptical, but he asks her to trust him to notify the Earth Alliance government of the impending threat. 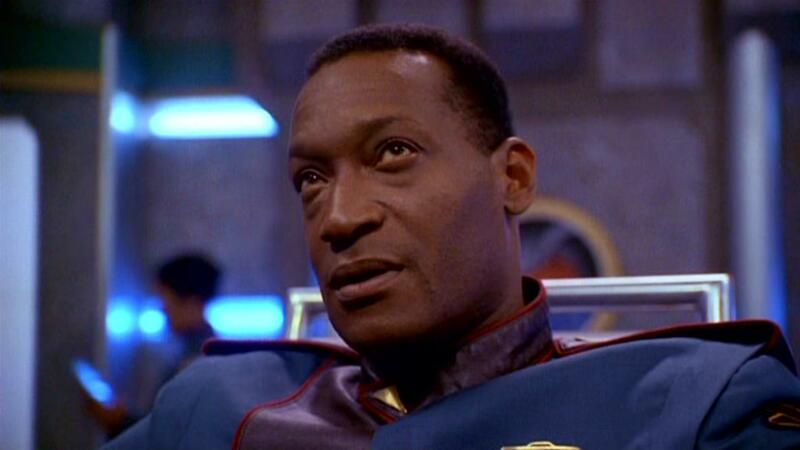 Sheridan is not popular on Earth, and the administration is more likely to listen to Captain Lochley. She agrees, and acts accordingly. Garibaldi discovers the source of the transmission to the Drakh ships; it was Drake, aboard the White Star. Garibaldi can be very persuasive when angry. The death cloud reaches Earth, but so do the Excalibur and the Victory. And the administration has sent forces, too. The defenders of Earth destroy the planet killer at the heart of the death cloud, but Captain Anderson and the crew of the Victory give their lives in the process. Anderson died keeping his promise to his daughter; he fought the monsters. In a final act of spite, the Drakh forces seed Earth’s atmosphere with a plague, which is technological, not biological. Earth is now under quarantine. 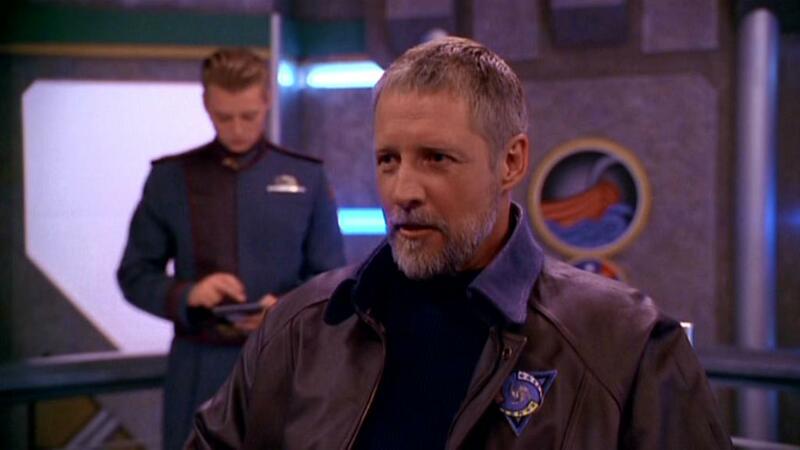 Sheridan briefs Lochley and Garibaldi on Babylon 5. The plague will kill all life on Earth in five years unless someone can find a cure. This cure will probably come from outer space, since the plague did. The Rangers will aid in the quest for the cure, and the Excalibur will be the main vessel whose crew is assigned to lead the mission. Failure is not an option. A Call to Arms sets the stage for the short-lived follow-up series, Crusade, set mainly aboard the Excalibur. 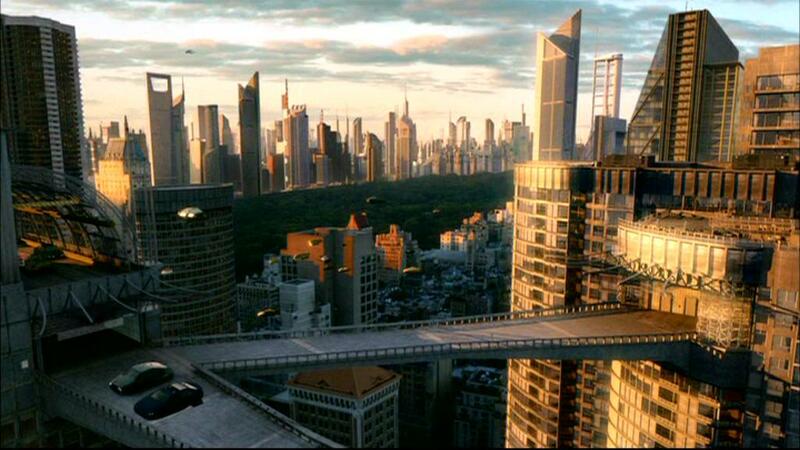 Suspense is not an issue, for we know from Sleeping in Light that Earth is plague-free in 2281, fifteen years later. But the important part is the journey, not the destination. J. Michael Straczynski (JMS) writes television programming about people within plots, not mainly about plots with people in them. 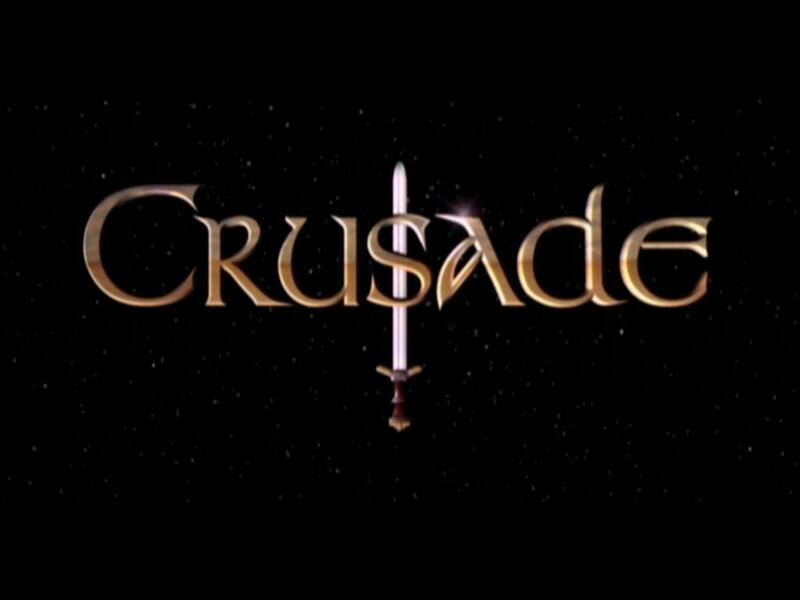 So it is that my next post in this series will be an overview of the Crusade series. My journey through the universe of Babylon 5 is almost complete. So I pause here to lay out and explain my plan for the remaining summary and review posts. 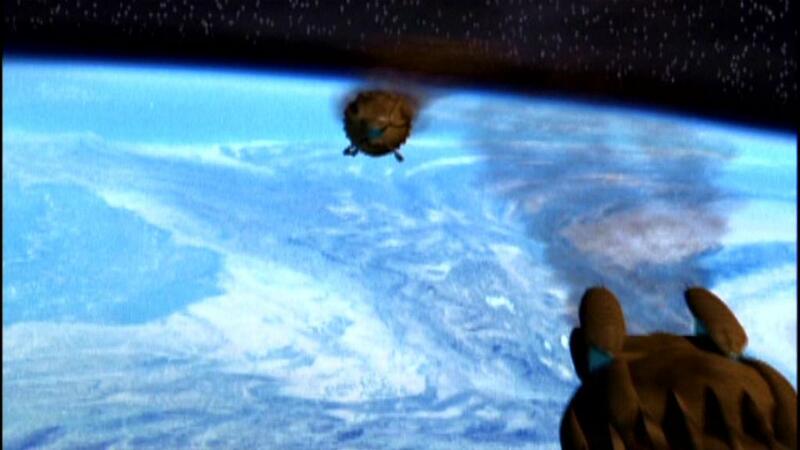 The Fall of Centauri Prime is episode 18 of the last season, which has 22 episodes. Episodes 19-21 (The Wheel of Fire, Objects in Motion, and Objects at Rest) conclude most story arcs, consisting mostly of farewells. Sleeping in Light, the series finale, dates to the end of the fourth season, when a fifth season looked unlikely, if not impossible. I have chosen to write the Sleeping in Light post last, for it is the last story in terms of chronology. Turner Network Television also commissioned a few television movies. I choose to ignore Thirdspace, set somewhere inside the fourth season. The continuity does not work well, and I dislike the film, which borrows too much from H. P. Lovecraft. Much better is The River of Souls (1998), set in middle 2263. I plan to write about In the Beginning (1998), in which the “present day” is 2278, with Emperor Londo Mollari as storyteller. Then there is A Call to Arms, set in November 2266, which sets the stage for the prematurely canceled series Crusade. This series was supposed to run for five years and have story arcs, just like Babylon 5, but TNT ended everything after 13 episodes. I wonder what B5 would have been with just 13 episodes. In 2001 the Sci-Fi Channel made The Legend of the Rangers–To Live and Die in Starlight, a pilot for a series the network did not pick up. I do not own a copy of this anymore, nor do I wish to do so. I taped it off cable television in 2002, and found it unsatisfactory then. Once I saw The Legend of the Rangers on sale, and thought it overpriced. $1 would be overpriced. 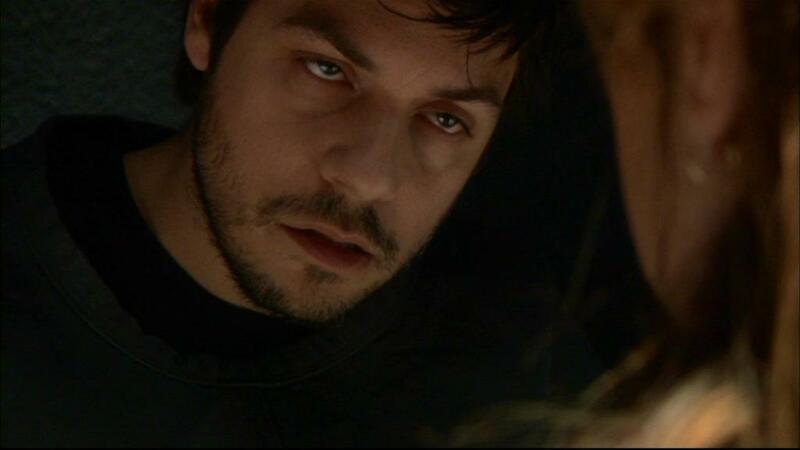 Consider this my review of that telefilm. I hope that these posts have interested some of you in this excellent programming. B5 has been a passion of mine since 1994, and I want to influence others to watch these episodes and enjoy them.